Visiting places is always wonderful but what makes it more wonderful is the people who are accompanying you to those places. A long weekend was coming on Aug 9th. As usually happens with IT people in Bangalore, any long weekend is ticket to some outstation. Like all many, we planned to go for pondicherry. On the way back, we planned to go for Mahablipuram and do a trek in Yelagiri. We booked a Qualis and left from Bangalore on thursday evening. Lucky for us that we had Bhavana who can communicate in South Indian languages and our driver Sateesh was not that good with Hindi or English. It turned out that Sateesh was a talkative person and since other than Bhavana nobody knew Kannada, so she had to listen and translate each time he said something. An overnight journey on the typical Indian Roads meant nobody got a good sleep. Mehetab was in front guiding the driver throughout the night using google maps. Biplob and Himanshu enjoyed the bumps on the backseats while me, Bhavana and Monica occupied the middle seats. Whole night, Mehetab kept on writing something deep in his phone which he showed to me few days later. Quite a piece he wrote. 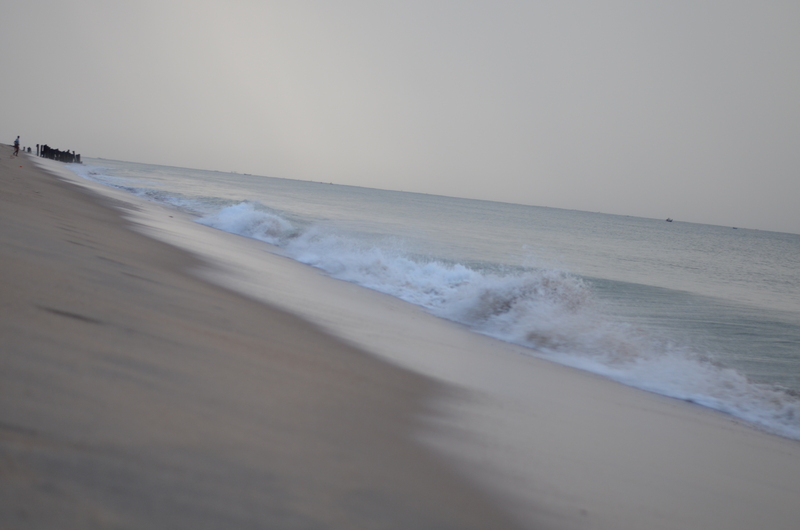 Morning 6’o clock, we were in pondicherry at Auro Beach. The big ocean, Bay of Bengal, was in front of us. I had a morning run on the beach and soon the beach was not scenic. There were polythene bags lying all around, people attending the call of nature. So we turned back to our hotel to get fresh and go find a Mosque so that Mehetab could attend the morning prayers of Eid-Al-Fitr. While he was attending the prayers, we found this small place, which looked like some temple from outside, to get the morning breakfast. We got poori-sabzi for the breakfast along with some vadas and idly and being from New Delhi, I would say I found the taste to be way better than I could have had ever imagined. After breakfast, we all were feeling sleepy. Since we had to wait for Mehetab to complete the Namaaz, myself, Himanshu and Biplob decided to have a nap in vehicle itself while Monica and Bhavana decided to get a walk in the city. It was noon time and we were at Auro Ashram. It is a silent place where followers of Shri Aurobindo comes to visit his mausoleum and meditate. Photography is not allowed there. One can get some books about the life of Sri Aurobindo and the mother, which are also available in many foreign languages. Ashram is quite beautiful. You can find a no. of varieties of Cactus which looks very beautiful. One can easily make this observation that Pondicherry is not like the other cities with Beaches but it has its own calmness. Its a good place to get relaxed and just do nothing. After Auro Ashram, we headed towards Promenade beach while taking some walks in the streets of Pudducherry. There are several ministries located near the Promenade beach area. Governer’s house looks like a big white church from outside. This area of pondi is also known as French Colony. A lot of houses bears the name plates in french. There is one big park in the same locality which adds the beauty to it. Promenade is not like other regular beaches. Its a rocky beach where government has put big stones to keep the city safe against the big waves. Just sit on the rocks and listen to some poetry. I am sure that many philosophers have got their wisdom thoughts sitting at that place. There are hawkers around selling lots of eataries. Soon we departed for Auroville, a place which is known as “a different world altogether inside pondicherry”. There is a big Matre Mandir under construction and is told to have the soils from 80+ countries. As per the running projet, the temple is in form of a big golden sphere and will be surrounded by a no. of beautiful gardens each garden bearing a theme suggested by The Mother, Mirra Alfassa. On your way to Matre Mandir from Auroville, you will find a no. of stones bearing the picture of some flower with a philosophical quote. It had been a lot of sightseeing since morning and now was some fun time. So we went to Paradise beach, had the swimming gears on and jumped in the Ocean. This was the only beach in pondi which was a bit cleaner than other beaches but still no match to the Arabic Ocean Beaches. Following the paradise, there is a private beach, Kailash Beach, where guards keep patrolling and wont let people from other beaches to enter. Me and Mehetab wanted to have a run on the shores, so we decided to go through the water. We had a run of around 8-10 KM covering 3-4 beaches. We came back to Promenade beach for our dinner and had a beautiful night walk afterwards on the MG Road. Never check-in to a hotel early in the morning because it follows the early morning checkout also which was quite painful next day. Anyways, getting ready early, breakfast at same temple like small place, we went to Promenade back as some of us had to shop. While others were busy shopping, me and Mehetab walked around and found french Institute of Pondicherry. Its a huge building with a sea facing library, only library where students would love to sit for hours 😛 . On our way to Mahabalipuram, we had lunch at chettinad hotel where you can find Chicken, Mutton and Fish Gravies without Chicken, Mutton and Fish 😉 (I can have a laugh being a vegetarian 🙂 ). Evening 5’o clock, we were in Mahabalipuram admiring the historical structures some of which were made of single stones. After Tsunami, many ancient temples have been unearthed in Mahabalipuram. Main temple is in need of saving as the sea winds are leading to the corrosion of stones. It was getting late at night so we decided to have night stay in Kanchipuram and started for Yelagiri around 3’o clock in the morning. On our way to uphill, me and Mehetab decided to get down while there was still 4Km left to cover and decided to go through all the bushes and rocks doing a trek of our own, making our own way. Getting scratched, bleeding but enjoying the path. Then we just rested in Yelagiri for the day. Lying there in music fountain park, talking about our childhood and making the discovery of OLAKUTTI, we all had a great fun. A trip, at the start of which many of us didn’t know each other, brought us closer to each other and made new friends. For summarized features of each of these softwares, Read Here.